Borderlands 2 is rammed full of easter eggs, especially those nodding to other games such as Dark Souls. Even the infamous Konami Code is in there, giving you access to ‘Extra Wubs’ mode. MP1st reports that by entering the Konami Code on the Borderlands 2 title screen – that’s Up, Up, Down, Down, Left, Right, Left, Right, B [crouch for PC/PS3 players], A [jump button for PC/PS3 players], Start – you will unlock the mode. Then go to the gameplay tab in the options menu. At the bottom you’ll see ‘Extra Wubs’ mode. 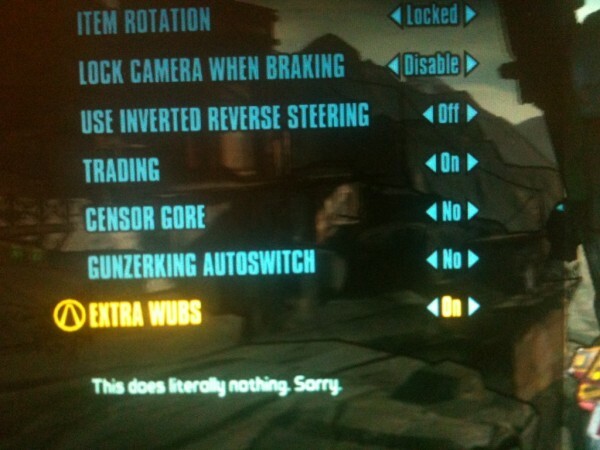 It does absolutely nothing, and comes with an apology from Gearbox. So yes, it’s pointless, but fans of Konami games of old will appreciate the reference. What other secrets are in there? If you’ve found one let us know below.